If you take a moment to read this post, you’ll have some idea of what we’ve been going through the last few days and nights around here. For some reason, Nik’s system decided that it didn’t need to be, um, regular and that’s been causing quite a bit of discomfort for him. Things reached critical mass this morning when even a suppository wouldn’t accomplish the job. Oh, well, that and Nik waking with a fever over 102 degrees Fahrenheit. After calling the doctor, we suspected we might be looking at abdominal x-rays after our office visit. Nik’s anatomy is not exactly the “standard issue” courtesy of his intestinal malrotation which gives him a greatly shortened tract. 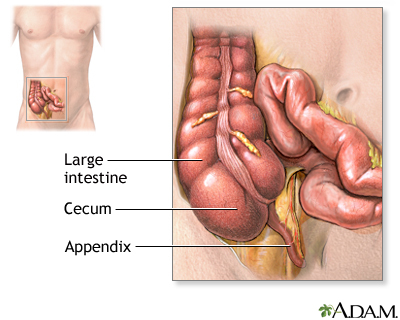 Where most people’s intestines and bowels look just like you might see in an anatomy book (or like this), Nik’s doesn’t have as many twists and turns. Well, actually, it had more twists —some of which nearly did him in just shy of his first birthday —including a sneakily hidden appendix diagonally opposite where it should have been (his was up under his stomach). Thanks to a fabulous surgeon in Oakland (yep, Nik’s a Californian, du-ude! ), Nik made it through but now has more of a short hairpin turn in his large intestine than the nice long U-which wraps around the perimeter. All this is to say that Nik’s been having some troubles and a lot of pain. And, that we can’t take a wait-and-see approach all the time because we don’t know what sort of scar tissue is there and what sort of nerve damage may or may not have occurred during his surgery. True to form, we went in expecting Thing A and came out with Thing B instead; that’s kind of par for the course with Nik. Thing B, as it turns out is another raging ear infection. When Doctor Mary exclaimed “Oh my goodness, Nikolas, no wonder you’re in pain!” we knew it wasn’t pretty. In spite of what all the ENT (ear-nose-throat) doctors say, it certainly is possible for a child with myringotomy tubes to have an infection without fluids draining out of the ear. We suspect that Nik’s got some dried fluid or wax in front of the actual tube (closer to the outer ear) which is blocking the drainage route. Kind of like a beaver dam in a river; it doesn’t necessarily block the entire flow but it restricts it enough to change the normal or expected course. So, hear we are, a mere nineteen days into the month and Nik has had a stomach bug, followed by strep, and now another ear infection. Poor guy. None the less, with the addition of yet another antibiotic (his second in as many weeks), some multidopholus powder to his formula, and the help of our dear, dear friend, Addie Ville, we’re forging ahead with our plans to visit Santa tomorrow on the Santa Clause Express train. We went last year and had a wonderful time. If Nik’s feeling better tomorrow, I expect it will be even better than last year! Well, Nik’s been quick to rebound from the nasty strep incident. He’s up and running and Mama’s trying to keep up! Lots to tell you about and no time to tell it. Climbing, running, getting into mischief. Appetite still so-so but he’s developed a serious affinity for Baba Ghanoush. Who knew my child was such a gourmand? La la. More to tell in the ongoing saga of the mysterious ear ailments. But that’s for another post when I can catch my breath. I spent a delightfully (not!) sleepless weekend alone with Nik (Niksdad had to work all weekend). We stayed up and partied all night long every night and then clung together like Kate Winslet and Leo DiCaprio on the Titanic. Well, truth be told, Nik clung and I just sank. I’ve never seen him so sick and miserable before. Folks, we’re talking about a child who spent 209 days in the NICU and has gone through countless surgeries —granted, he had the benefit of some really groovy drugs for those. He would not let me out of his sight. He spent the better part of the past two days laying on top of me. If I had to get up to go to the bathroom or into the kitchen —both of which are within sight of the family room and are only a few feet away (hey, our house is pretty small) —Nik would follow me and cling to my pants. When I gently pushed him out of the way of the gate as it closed, separating us for a mere minute or two, Nik would convulse with shrieks and wails, he’d bang his head on the gate and claw at his already tender ear. It was pathetic and heart-stoppingly frightening at the same time. What on earth had become of my happy-go-lucky independent kid who was always content to hang out and play by himself? What could possibly have happened to cause such angst and anxiety in a mere five year old? I still don’t have the answer to that one. I’m hoping it’s a temporary aberration. Today, however, after three days of antibiotics, there is a sliver of sunlight shining through. I have been able to leave the room for brief periods. Nik fussed but didn’t melt down. And, despite having been up nearly all night (I think only sleeping from 8 p.m. to 9:30, then again from 10:30 p.m. to 1:30 a.m. qualifies; I only slept the latter portion of that stint), Nik has been in remarkably good spirits. He has been content to play with his toys again. For the past two days they have all been completely ignored in favor of mama’s lap. Whew. The fever seems to have broken but the tongue is still sporting its lovely white coat with pink spots indicative of strep throat —which he may have picked up from his cousin last week, we think. We’ll be partying with our pals Advil and Mucinex for a while longer, I think. As for me? Well, I joked about having a party with my friends Cabernet Sauvignon, Pinot Noir and, possibly, Jose Cuervo. Sorry guys, Mama’s too pooped to party! It seems like things have been moving along at a nice clip in our lives lately. Nik’s been doing really well and making tremendous progress in many areas —especially in both receptive and expressive communication skills —. He’s been eating like a champ, growing like a weed and, generally, just taking off like a little rocket! Saw two of his favorite doctors today and they both knew, instantly, that there was something wrong. They just don’t know what. Ears? Fine. Lungs? Clear. Sinuses? No problem. Throat? A bit red —choking on a cracker on Wednesday night could do that to a child— but nothing remarkable. None the less, wonderful Dr. Mary did a strep culture; results won’t be back until Sunday evening. So, we’re spending the weekend laying low and hanging out with our good, good friends Advil and Zithromax. Mommy might invite her friends, Cabernet Sauvignon and Pinot Noir, over to keep her company while Daddy works. If it gets really crazy, she might invite her old pal Jose Cuervo, too! Well, our trip to the doctor this morning turned out to be very worthwhile. In spite of the long drive —an hour up and two and a half hours back courtesy of summer traffic to the DE and MD beaches— we got a diagnosis and some reassurance. Basically, Nik has (had?) something called Henoch-Schonlein Purpura (HSP) which, though I’d never heard of it until today, is apparently moderately common; especially in kids Nik’s age. It’s some kind of vasculitis caused by either a viral or bacterial infection —or sometimes from reactions certain meds. Fortunately, for us, Nik does not appear to be allergic to either his current antibiotic —a good thing since we’re already pretty limited in what he can take— or to his seizure medication. 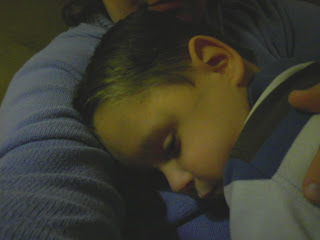 At this point, there’s nothing we can do, really, except manage the symptoms; he can only have Tylenol for the next few weeks because of his upcoming surgery (ear tubes put in and adenoids removed on the 30th). We just have to keep an eye on the rash and call the doc if it gets worse. Otherwise, things should resolve in a matter of a week or two —or six. 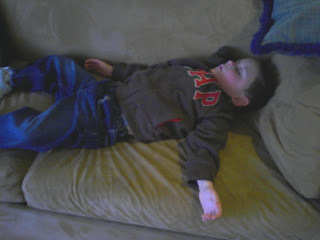 When we finally made it home, I had a raging headache and needed a nap. Niksdad took Nik out for a while to burn off some pent up energy from our long car ride. When they returned and I awoke —much refreshed —we took our little fish to my sister’s house for a swim. Forty-five minutes in the water was just what the doctor ordered for all of us! Too pooped to care about nutrition, we had take out from Applebee’s. Nik is sound asleep and Niksdad is on his way home from Blockbuster with a movie. I guess you could say we’re on the mend once more!